Book Description The Sun Certified Java Developer Exam with J2SE 5 is two-pronged in approach, highlighting the new features offered by the release of J2SE 5 and providing practical instruction for mastering these new features by working through a project with requirements and structure similar to the project found in the Sun Certified Java Developer (SCJD) examination. Assuming a certain level of Java skill, the authors bypass the introductory information provided in many of today's Java books, instead starting with a discussion of the SCJD examination and the generalities surrounding the required programming assignment. After a preliminary overview of the SCJD project requirements, readers are introduced to a sample project that will be developed throughout the entire book, with each project component developed alongside the relevant new J2SE 5 feature. 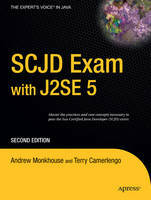 Excluding general Java concepts, the authors instead focus on what readers need to know, providing the information necessary to quickly bring the reader up-to-speed on the J2SE 5 release and offering a pointed tutorial regarding how these new concepts can be applied toward successfully passing the SCJD exam. Regardless of whether readers intend on earning Java certification, The Sun Certified Java Developer Exam with J2SE 5 offers a supremely practical means for getting the jump on the latest Java features. Andrew Monkhouse is the Manager, Information Systems for an international Occupational Health and Safety company and is currently re architecting their software product in Java. Terry Camerlengo holds degrees in Computer Science and Philosophy from The Ohio State University. Professionally, he has more than seven years of experience analyzing, designing, building, and testing large-scale enterprise systems and is certified in C++, Java and SQL Server.